Water inside the tent is never a good thing. 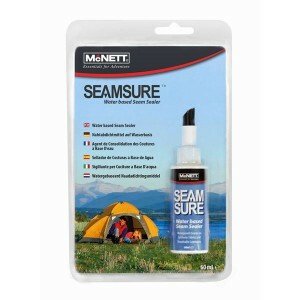 Use Seam Sure™ Water Based Seam Sealer to seal and waterproof the seams of your tent, tarp, pack and rainwear. Durable, odorless and flexible, Seam Sure is perfect for family-sized tents. Plus, its water-based formula is good for the earth. 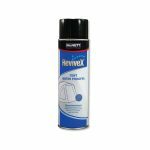 Ideal for sealing seams on polyurethane coated fabrics. Seam Sure flexes with the fabric insuring waterproofing even in cold temperatures and high wind conditions. Our unique brush applicator allows the user to easily apply Seam Sure into needle holes, sewn joints, corners and under lap-felled and folded seams. Seam Sure is part of a comprehensive line of Care and Repair products from McNett®. With McNett®, anyone can be a master of equipment repair. 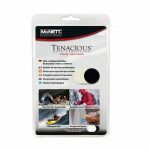 Seam Sure™ is part of the McNett GEAR AID™ product range. Remove old seam sealer with stiff bristle brush and isopropyl alcohol. Shake well before use. Remove inner foil. Pull brush top open. Squeeze bottle gently and apply a thin, even film to stitching on coated side of fabric (or inside of item). Use brush to work into needle holes, sewn joints, corners and under lap-felled and folded seams. Clean drips and excess with damp cloth. Allow to fully dry before use or folding (minimum 2 hours at room temperature; longer if colder). Test for dryness before use. CLEAN-UP & STORAGE: Close brush top and wash bristles with soap and water immediately after use; stiff bristles may be loosened with lacquer thinner. Store in a cool, dry place. Tent Seam Sealing: Perimeter seams on ‘seam taped’ tents are not factory sealed and require sealing. Apply a thin film of SeamSure to inside floor seams (fig.1). Allow to dry overnight. 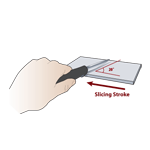 Use SeamSure to seal areas that regularly leak, such as stake-out points at corners (fig. 2). To seal the seams on your rainfly, set it up inside-out for easier application. Attach the rainfly to the tent so all seams are taut (fig. 3). When cured (dry) Seam Sure is a odorless, invisible film. Seam Sure is applied to stitched sewn seams of tents, tarps and outerwear. Allow to cure over a period of 2 hours. When applied, Seam Sure is permanent and a long-lasting film with a non-gloss finish. Seam Sure is washable and dry-cleanable. 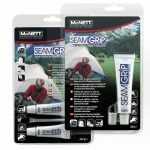 Seam Grip® permanently repairs common pinholes and tears in your outerwear. Apply just enough Seam Grip to cover the hole and spread 1/4” (5mm) beyond. Allow to dry level overnight. 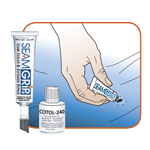 For 2 hour cure time, mix Seam Grip with Cotol-240™ before applying.